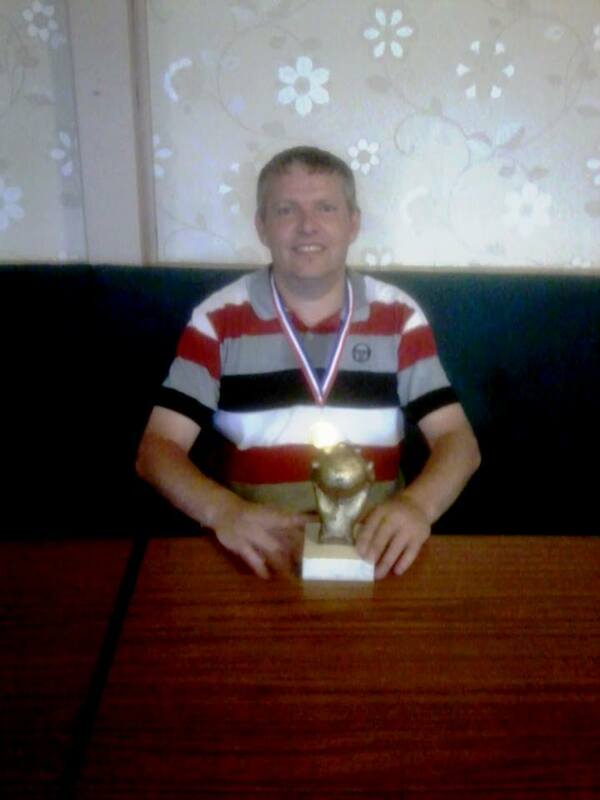 Inverleith Petanque Club were hosts to the Scottish Singles, Shooting and Doubles titles on 27 and 28th July. The SPA would like to thank Inverleith for their hospitality and stovies! Inverleith’s piste has undergone a bit of a makeover, with a new surface added in parts, seating and new score boards all in time for the Home Nations in August. Well done to them for all their hard work. The Singles and Doubles competitions followed the Swiss Ladder format and six rounds were played in each. 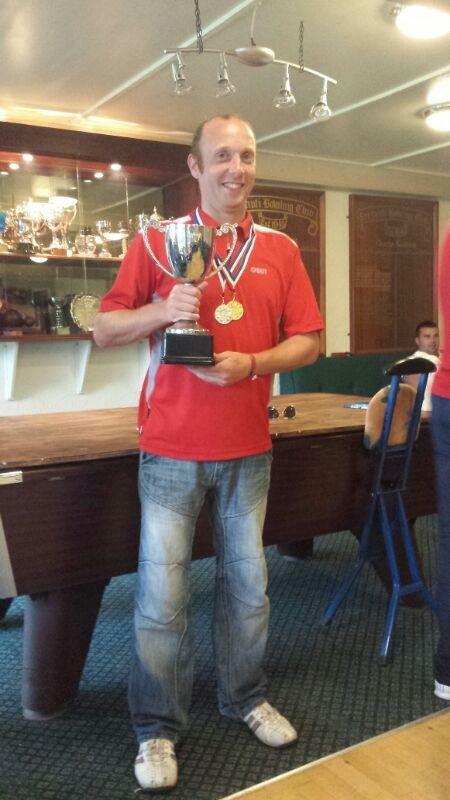 The Singles was contested by 21 players but was yet again dominated by one man, Robbie Stronach. Throughout the day he saw off everyone in his path in emphatic style although the title was not secured until he won his last game against Kevin Johnstone. A win for Kevin in that game would see him take the title on BHN. In the end Robbie won comfortably and took the title for the 3rd year running with a perfect record of 6 wins and having only dropped 20 points all day. Colin Stewart snuck into 2nd place and Kevin Johnstone was 3rd on superior BHN. The Shooting was held at the same time as the Singles with players invited to register a qualifying score for the Shooting in the breaks between Singles games. After all qualifying scores were registered, the top 4 players played off in Semi Finals. The Semis were Robbie Stronach v Ed Strachan and Kevin Johnstone v Istvan Poka. Robbie and Kevin emerged victorious from their Semi Finals but, as play was about to begin in the Final the heavens opened. After a bit of discussion it was agreed to abandon the final and with Kevin not returning for the Doubles the following day the competition ended. Robbie agreed to give Kevin the trophy (Kevin had the highest total points score over the two rounds which were played). The Doubles, on the Sunday, was played for the most part in heavy rain, it only clearing to leave sunshine well into the afternoon. So puddles, brollies and waterproofs were the order of the day and 12 teams stepped out into the wet. With play not limited by time there were some long games but most of those who had to wait were probably grateful for the opportunity to dry off in the clubhouse. Reigning champions IPA – Colin Stewart & Istvan Poka were again in fine form. 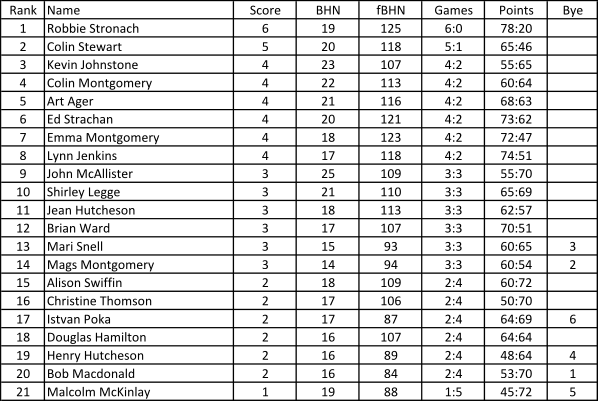 Despite two close games against Fasch – Robbie Stronach & Johnny Wilson and Acorns – Brian Ward & Malcolm McKinlay ( which IPA knew they had to win the latter to ensure victory with Robbie & Johnny snapping at their heels resulting in a tense affair) IPA retained the title with 6 wins from 6. Robbie & Johnny finished second with 5 wins and Les Champignons – Colin & Mags Montgomery finished in 3rd place with 4 wins. Congratulations to all the winners. Next up is the Home Nations at Inverleith on 10th and 11th August where we look forward to welcoming our English and Welsh friends for some serious petanque and camaraderie.